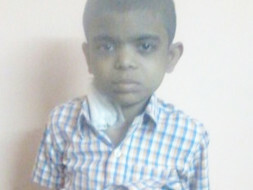 Fundraising to help my nephew Atharva fight a fatal kidney disorder. Please support my campaign! He was diagnosed with a fatal kidney disorder in when he was 6months Hemolytic-uremic syndrome. It is a medical emergency and carries a 5–10% mortality; of the remainder, the majority recover without major consequences but a small proportion develop chronic kidney disease and are forced to go for a kidney replacement. Despite the horrible side effects and being on the ventilator for a couple of days, his family has not lost hope. He was discharged in July, 2013 and since then has been on dialysis that could be arranged for at home (Peritoneal Dialysis). However, his health has always been on the decline side with the medical reports suggesting the same. He has now been advised to go for a kidney transplant, for his kidney has not shown any improvement in the last year and a half. It is sad for us to tell you that Atharva is no more with us in the world. His soul is resting in peace.